How to Deliver Presentations using Mind Maps | Download PowerPoint Mindmap now! ConceptDraw MINDMAP is a software for creating mindmap presentations. You can effectively generate, change, and update your mindmap then choose the most suitable slides for the presentation on the Slide Navigator and start presentation. During making presentation you can change slide order and pick the resulting zoom for each slide. Sample 1. 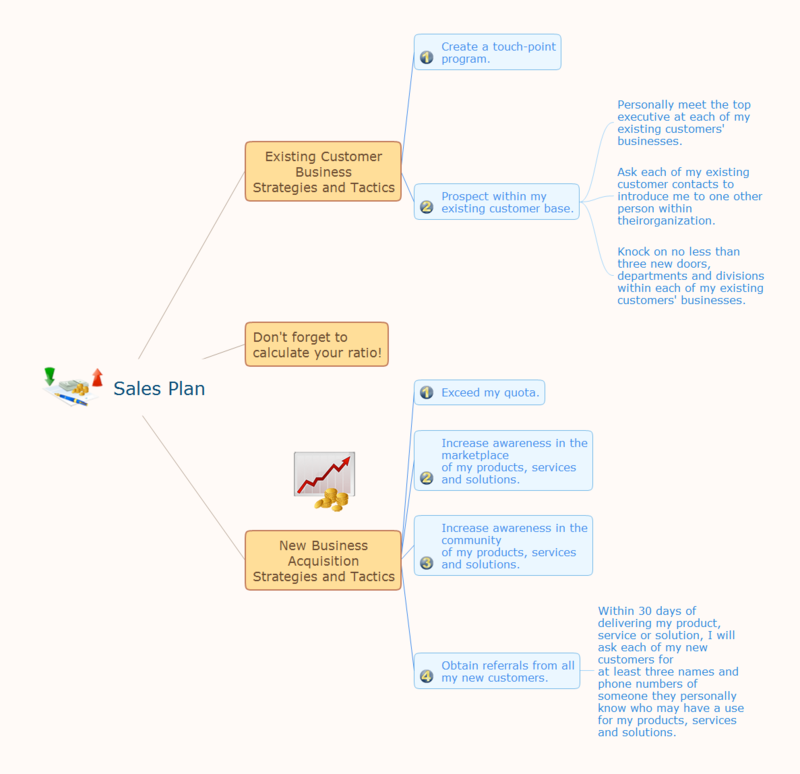 Mindmap presentation - Sales plan. Presentation Exchange solution extends ConceptDraw MINDMAP software with the ability to import presentations from Microsoft PowerPoint, as well as enhancing its existing presentation capabilities. With the Presentation Exchange solution you can easily extract the content from a PowerPoint presentation to see how it all fits together in a single view. You can review slide content, see how the slides support one another, and refine the story. The intuitive interface of ConceptDraw MINDMAP v10 and the Functional Tools overview below will guide you in creating and demonstrating powerful mind map presentations using template. An advanced tool allows you effectively generate, change, and update your presentation. Create your own flow charts of settlement processes using the ConceptDraw DIAGRAM v12 diagramming and vector drawing software extended with the Cross-Functional Flowcharts solution from the Business Processes area of ConceptDraw Solution Park. Download easy flowchart software to create settlement process flowcharts show steps of monthly settlement with your business quickly and easily. Use of various charts, diagrams and infographics is the most effective way of visual presenting information about healthy foods, healthy eating and healthy diet. ConceptDraw DIAGRAM v12 diagramming and vector drawing software offers the Health Food solution from the Food and Beverage area of ConceptDraw Solution Park which is overfull of powerful drawing tools, libraries with ready-to-use vector objects and clipart, predesigned samples and examples which will help you easy design healthy foods illustrations. When you prepare professional-looking presentation, you need to use ConceptDraw MINDMAP v10 software for the amazing result. ConceptDraw MINDMAP v10 the will guide you in creating and demonstrating powerful mind map presentations. Collaborating with co-workers is very important, not only in order to get things done effectively, but also to keep in touch with the outside world. Great way for business collaboration is Skype. This sample was created in ConceptDraw DIAGRAM v12 diagramming and vector drawing software using the Pie Charts Solution from Graphs and Charts area of ConceptDraw Solution Park. This sample shows the Pie Chart of the approximate air composition. You can see the percentage of oxygen, nitrogen and other gases in the air visualized on this Pie Chart.